AC/DC Iron Man 2 (2010 UK Collectors Edition 2-disc [CD/DVD] set - Through a unique collaboration between Marvel Studios and Columbia Records, AC/DC's music will be featured in Marvel Studios' 'Iron Man 2', the sequel to the 2008 blockbuster film. 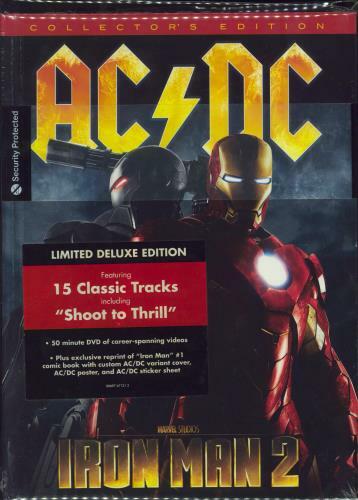 This 2-disc edition comprises the 15-track soundtrack album featuring 15 classic AC/DC songs selected from ten of the band's studio albums, ranging from 1976 to 2008; plus Bonus Region 0 NTSC DVD containing a collection of live performances, alongside the music video [and making of] for 'Shoot To Thrill'. Both discs are housed in the SEALED foil-stamped deluxe oversized hardcover book complete with a 32-page booklet featuring liner notes by David Fricke, an exclusive limited edition reprint of 'The Invincible Iron Man' #1  comic book with a custom variant cover by Adi Granov featuring AC/DC and back cover cartoon by Angus Young plus AC/DC poster and stickers! ).